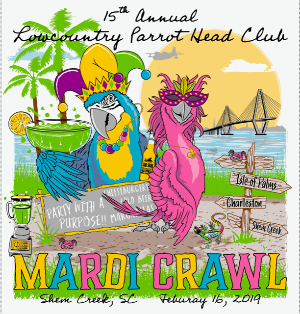 The Lowcountry Parrot Head Club (LCPHC) was formed August 19th, 1997 for all those in the Lowcountry of South Carolina who are interested in the music and lifestyle of Jimmy Buffett, along with a variety of social activities, and most importantly, the opportunity to “party with a purpose” as we volunteer for local community and environmental causes like The Alzheimer’s Association, Pet Helpers, Ronald McDonald House, Hospitality Heroes and more . The club is designed so that you can have a lot of fun and make a difference at the same time! The LCPHC is a proud member chapter of Parrotheads In Paradise, or PHIP, and is one of over 200 clubs located across the United States, Canada and Australia. Since the inception of PHIP, the LCPHC, along with the other 200+ clubs worldwide, have contributed $30 million and logged more than 3 million volunteer hours in just over a decade, to various causes from Alzheimer’s Disease to Zoos, and everything in between. We meet on the third Tuesday of every month at Red’s Icehouse on Shem Creek in Mt. Pleasant, SC at 7:00pm. It’s always a good time, so drop on by! !